Format: Paperback. Notes: Item in very good condition! Condition: Very Good. Encyclopedia of Electronic Components, Paperback by Platt, Charles; Jansson, Fredrik, ISBN 1449334318, ISBN-13 9781449334314. Want to know how to use an electronic component?. Easy to browse: parts are clearly organized by component type. Encyclopedia of Electronic Components, Paperback by Platt, Charles, ISBN 1449333893, ISBN-13 9781449333898 Provides information about components, including batteries, capacitors, diodes, and switches. Most of our items we sell are used and are in good condition. Since our items are mostly used, digital codes are not always valid. We cannot and do not guarantee codes will be unused, redeemable, or included. Our books may contain highlighting or writing. We ship Monday – Friday. Thank you for supporting Goodwill Industries of South Florida. Trending at $5.49eBay determines this price through a machine learned model of the product's sale prices within the last 90 days. Encyclopedia of Electronic Circuits. Literally thousands of circuits. Bridge Circuits. Clock Circuits. Computer Circuits. Delay Circuits. Fuzz Circuits. Hall Effect Circuits. This guide is an ideal review tool for state licensing, the NCC credential, and preparation for written and oral boards. Book is in good condition. Trending at $16.16eBay determines this price through a machine learned model of the product's sale prices within the last 90 days. 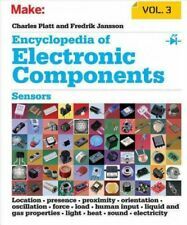 Encyclopedia of Electronic Components: Sensors for Location, Presence, Proximity, Orientation, Oscil by Charles Platt 9781449334314 (Paperback, 2016). Want to know how to use an electronic component?. 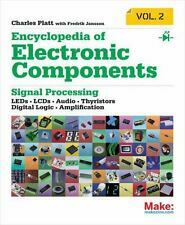 Encyclopedia of Electronic Components: LEDs, LCDs, Audio, Thyristors, Digital Logic, and Amplificati by Charles Platt 9781449334185 (Paperback, 2014). Provides information about commonly used electronic components, discussing what each part does, how it works, why it's useful, and what variants exist, including integrated circuits, lasers, transducers, LCDs, and headphones. By Tek Nek. Pre-Owned Encyclopedia Britannica Talking U.S. Puzzle. Push down flag for Pledge of Allegiance. Want to know how to use an electronic component?. Beginners will quickly grasp important concepts, and more experienced users will find the specific details their projects require. Charles Platt is a Contributing Editor and regular columnist for Make magazine, where he writes about electronics. Encyclopedia of Electronic Components: Sensors for Location, Presence, Proximity, Orientation, Oscillation, Force, Load, Human Input, Liquid and Gas Properties, Light, Heat, Sound, and Electricity by Charles Platt. Cloth Book with 974 Pages 1962. No Writings in this Book. Edited by Charles Susskind. Author Rudolf F. Graf, William Sheets. This is it.". a ready source to which to turn for just about any type of circuit you can imagine.—Modern Electronics. Easy to use and incredibly complete, it is the perfect sourcebook for all levels of electronics practitioners. Franklin Big League Baseball Electronic Encyclopedia BLB-2 . Condition is Used. Shipped with USPS Priority Mail. Encyclopedia of Electronic Components : Leds, Lcds, Audio, Thyristors, Digital Logic, and Amplification, Paperback by Platt, Charles; Jansson, Fredrik (CON), ISBN 1449334180, ISBN-13 9781449334185 Provides information about commonly used electronic components, discussing what each part does, how it works, why it's useful, and what variants exist, including integrated circuits, lasers, transducers, LCDs, and headphones. 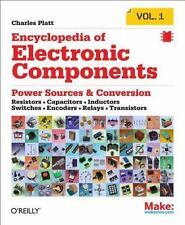 Encyclopedia of Electronic Components Resistors, Capacitors, Inductors, Semiconductors, Electromagne by Charles Platt 9781449333898 (Paperback, 2012). Encyclopedia of Electronic Components. Provides information about components, including batteries, capacitors, diodes, and switches. Trending at $17.61eBay determines this price through a machine learned model of the product's sale prices within the last 90 days.